NEW YORK/WASHINGTON: A group of prominent Democratic Party fundraisers on Friday began circulating a letter to encourage a hesitant Vice President Joe Biden to enter the 2016 race for US president. The letter, signed by nearly 50 people, calls the Obama-Biden administration a “spectacular success”. It cites job creation, a lower unemployment rate, new health insurance policies for nearly 9 million Americans and the end of wars in Iraq and Afghanistan. “To finish the job, America needs a leader who is respected both home and abroad, and who understands the real challenges facing American families. In our opinion, the next president must be Joe Biden. If he announces he’s running, we’re all in. It’s a campaign we know he will win,” the letter says. The signers are donors, Democratic activists and friends of Biden who have yet to throw their full support behind Hillary Clinton, the presumptive frontrunner for the Democratic nomination to the November 2016 election. Their call is the most provocative yet for Biden to take her on and suggests a broad network backing the vice president is beginning to take shape. The letter makes no mention of Clinton. John Maa, a member of the Democratic National Committee’s national finance committee who is among the signers, said he was contacted this week by another finance committee member to see if he would support Biden financially. Maa replied he would be happy to raise funds for Biden but that donors were becoming impatient. “Time is precious,” Maa said. “I know many people who will gladly contribute, and I will absolutely try to organize,” he said. The letter’s significance goes beyond a simple declaration of support. It appears aimed at pressuring Biden to decide soon. “We are ready if he’s ready,” they write. 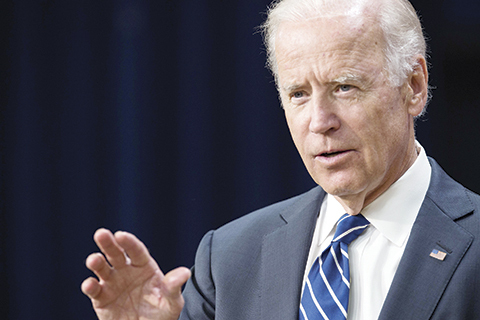 Jon Cooper, the finance chairman of Draft Biden, a political action committee formed to advocate for Biden’s entry into the race, said Biden has further support. “For everyone who signed that letter, there are at least one or two more ready to commit to him the moment he says he’s running,” said Cooper, a Long Island, New York, businessman who raised funds for President Barack Obama’s reelection campaign in 2012. The fundraisers who initiated the letter consulted Draft Biden in preparing their appeal. Cooper said the effort gained momentum after Biden’s emotional interview with talk show host Stephen Colbert last week. “That really galvanized folks around the country,” he said. Biden has sent conflicting signals about his intentions. His public accounts of his despair in the wake of his son Beau’s death this year have made him sound hesitant about joining the race. At the same time, he has met with Democratic luminaries such as Senator Elizabeth Warren of Massachusetts and key party donors. He has also embarked on a travel schedule as vice president that this week takes him to California, Michigan and Ohio, states that could be decisive in the election. The vice president’s office said it would not comment on the letter. A similar effort by liberal Democrats to encourage Warren to take on Clinton for the party’s nomination failed earlier this year. After coming under increasing pressure to run, Warren said she would not seek the presidency in 2016. Biden has been huddling with advisers, trying to determine whether he can mount a credible bid in the face of Clinton’s financial and organizational advantages. That process will continue, independent of any movement to draft Biden, a source close to the vice president told Reuters. Clinton, 67, a former secretary of state, US senator and first lady, announced her candidacy in April. Her frontrunner status has taken a beating over her use of a private email server while she was Obama’s secretary of state. She has seen her support in polls tumble, creating a potential opening for Biden, 72, a former US senator who became vice president when Obama became president in January 2009. Mary Lyndon Haviland, a global health consultant from Lyme, Connecticut, called Clinton an “amazing leader” but said she doesn’t connect with “everyday” Americans. “Right now, I remain concerned that even some of her greatest supporters find it hard to find enthusiasm for the election,” Haviland said. The Draft Biden political action committee was established independently of Biden’s team of advisers to lay the groundwork for a potential Biden run. It has hired operatives in the early voting states of Iowa, New Hampshire, South Carolina and Nevada.